Vancouver is known for parks, sightseeing, zoos & aquariums, museums, and trails. Your plan includes some of its best attractions: stroll through Stanley Park, hike along Seawall in Vancouver, meet the residents at Vancouver Aquarium, and take a stroll through Granville Island. To see other places to visit, maps, more things to do, and tourist information, refer to the Vancouver vacation trip planner. Sydney, Australia to Vancouver is an approximately 19-hour flight. You'll gain 18 hours traveling from Sydney to Vancouver due to the time zone difference. Traveling from Sydney in July, expect Vancouver to be somewhat warmer, temps between 26°C and 16°C. Cap off your sightseeing on the 5th (Wed) early enough to go by car to Whistler. 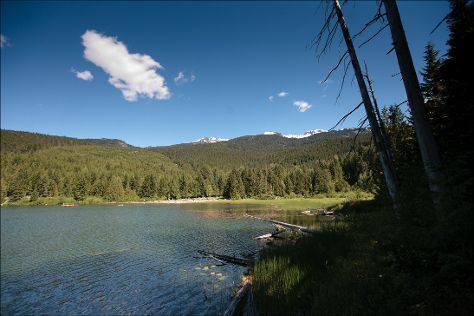 Kick off your visit on the 5th (Wed): have fun at Whistler Sliding Centre and then explore the activities along Lost Lake. Keep things going the next day: play a few rounds at Whistler Blackcomb and then get great views at Peak 2 Peak Gondola. To see traveler tips, where to stay, and other tourist information, read our Whistler trip itinerary builder. You can drive from Vancouver to Whistler in 2 hours. Other options are to take a shuttle; or take a bus. Plan for little chillier nights when traveling from Vancouver in July since evenings lows in Whistler dip to 12°C. Cap off your sightseeing on the 7th (Fri) early enough to travel to Kelowna. On the 7th (Fri), take in breathtaking views at Myra Canyon Park and then awaken your taste buds at some of the top wineries in the area. On your second day here, do a tasting at Mission Hill Family Estate Winery, then do a tasting at Quails' Gate Winery, and then contemplate the waterfront views at Lake Okanagan. To find other places to visit, where to stay, more things to do, and tourist information, you can read our Kelowna vacation trip planner. Traveling by combination of bus and flight from Whistler to Kelowna takes 5.5 hours. Alternatively, you can drive; or take a bus. Traveling from Whistler in July, you will find days in Kelowna are somewhat warmer (34°C), and nights are about the same (13°C). Finish your sightseeing early on the 9th (Sun) so you can drive to Banff National Park. Venture out of the city with trips to Peyto Lake (in Lake Louise) and Banff (Bow Falls, Banff Park Museum, & more). The adventure continues: contemplate the waterfront views at Moraine Lake, look for gifts at Wilsons Mountain Sports, explore the stunning scenery at Johnston Canyon, and take some stellar pictures from Fairview Lookout. To find traveler tips, maps, more things to do, and other tourist information, read our Banff National Park trip builder. Getting from Kelowna to Banff National Park by car takes about 6.5 hours. Other options: do a combination of flight, shuttle, and bus; or take a bus. You'll lose 1 hour traveling from Kelowna to Banff National Park due to the time zone difference. 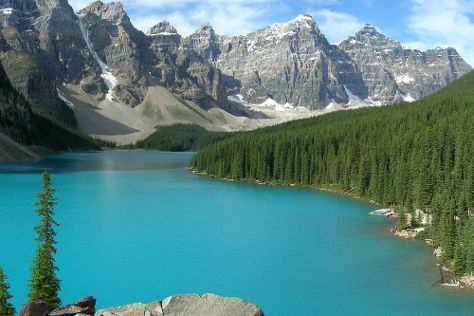 Traveling from Kelowna in July, expect Banff National Park to be slightly colder, temps between 23°C and 6°C. Wrap up your sightseeing on the 13th (Thu) to allow time to drive to Calgary. For other places to visit, reviews, more things to do, and more tourist information, use the Calgary holiday planner. Traveling by car from Banff National Park to Calgary takes 2.5 hours. Alternatively, you can take a bus; or take a shuttle. Expect somewhat warmer temperatures when traveling from Banff National Park in July; daily highs in Calgary reach 27°C and lows reach 13°C. Wrap up your sightseeing by early afternoon on the 14th (Fri) to allow time for travel to Quebec City. On the 15th (Sat), take a stroll through Lower Town (Basse-Ville), then examine the collection at Musée de la civilisation, and then take in the architecture and atmosphere at Cathedral of the Holy Trinity. Here are some ideas for day two: take an in-depth tour of Musée national des beaux-arts du Québec and then stroll through Plains of Abraham. 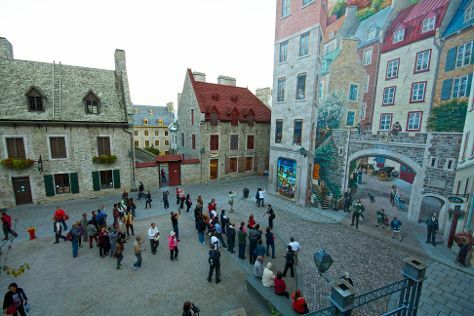 To find other places to visit, traveler tips, reviews, and other tourist information, use the Quebec City custom trip planner. Traveling by combination of flight and bus from Calgary to Quebec City takes 10 hours. Alternatively, you can drive; or take a bus. The time zone changes from Mountain Standard Time to Eastern Standard Time, which is usually a 2 hour difference. Traveling from Calgary in July, things will get somewhat warmer in Quebec City: highs are around 32°C and lows about 19°C. Wrap up your sightseeing on the 17th (Mon) to allow time to drive to Montreal. Kick off your visit on the 17th (Mon): admire the striking features of Notre Dame Basilica, then contemplate in the serene atmosphere at Saint Joseph's Oratory of Mount Royal, and then take your sightseeing to a higher altitude at Mont (Mount) Royal. Keep things going the next day: get a new perspective on nature at Biodome de Montreal and then take in nature's colorful creations at Montreal Botanical Gardens. To see photos, more things to do, and tourist information, read our Montreal itinerary planner. You can drive from Quebec City to Montreal in 3 hours. Other options are to take a bus; or take a train. In July, plan for daily highs up to 31°C, and evening lows to 21°C. Cap off your sightseeing on the 18th (Tue) early enough to go by car to Quebec City. 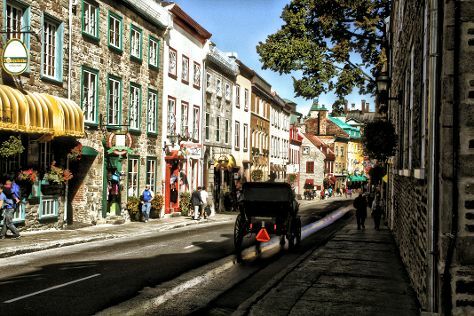 See even more of Quebec City: take a stroll through Old Quebec, appreciate the extensive heritage of Place Royale, stop by Geomania, and contemplate in the serene atmosphere at Notre-Dame de Québec Basilica-Cathedral. To find where to stay, maps, traveler tips, and other tourist information, read our Quebec City tour planner. Traveling by car from Montreal to Quebec City takes 3 hours. Alternatively, you can take a bus; or take a train. Finish your sightseeing early on the 21st (Fri) to allow enough time to travel to Vancouver. Start off your visit on the 22nd (Sat): admire the natural beauty at Queen Elizabeth Park, then take in nature's colorful creations at VanDusen Botanical Garden, then take a stroll through Gastown, and finally take in panoramic vistas at Vancouver Lookout. Here are some ideas for day two: enjoy the sand and surf at Kitsilano Beach, explore the activities along English Bay, then snap pictures at Lynn Canyon Park, and finally tour the old-fashioned way with a train tour. To see reviews, maps, and more tourist information, you can read our Vancouver trip itinerary maker. Do a combination of bus and flight from Quebec City to Vancouver in 10 hours. Alternatively, you can drive; or take a bus. Due to the time zone difference, you'll gain 3 hours traveling from Quebec City to Vancouver. When traveling from Quebec City in July, plan for a bit cooler days in Vancouver, with highs around 26°C, while nights are about the same with lows around 16°C. Wrap up your sightseeing by early afternoon on the 24th (Mon) to allow enough time to travel back home.